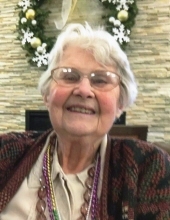 After a glorious life of 96 years, Patricia Abigail Shewczyk passed away February 4th, 2019 in Cedarburg, Wisconsin. Pat was born in Paris, Maine on October 7, 1922 to John and Abigail (nee Starbird) Dorney. After graduating from Washington High School in Milwaukee, Wisconsin, Pat attended the University of Wisconsin-Madison and in 1944 earned a degree in Education. She met her soon-to-be husband, Frank Shewczyk while they were both working in a restaurant in Madison, Wisconsin. Pat went on to work at Brodhead High School, where she taught Home Economics as Frank served in the Navy. At the end of WWII, Pat and Frank married December 23, 1946 and moved to Milwaukee, Wisconsin where Pat raised her family and served in many organizations. In 1973 the family was transferred to Santa Barbara, California and settled in adjacent Goleta. Pat was an avid quilter and fiber artist, as well as a voracious reader belonging to multiple book clubs. In California Pat became interested and involved in politics. She was active in the League of Women Voters and championed the Women’s Equal Rights Amendment to the U.S. Constitution. In 1981 she was elected to the Board of Directors of the Goleta Water District which was a powerful organization that determined the water distribution for the semi-arid environment and thus controlled economic development in the area. She was eventually elected President of the Board and served until 1986. Although she subsequently recused herself from local politics, Pat remained a passionate supporter of animal rights and environmental causes for the rest of her life. Throughout her years in Santa Barbara, Pat was a member and strong supporter of the United Methodist Church community, a relationship she deeply cherished. The family will hold a memorial celebration of Patricia’s life at a later date. In lieu of flowers, the family suggests memorial contributions to the First United Methodist Church at 305 E. Anapamu Street, Santa Barbara, California, 93101 or Hunger Task Force The Farm at 9000 S. 68th Street, Franklin, Wi 53132. To send flowers or a remembrance gift to the family of Patricia "Pat" A. Shewczyk, please visit our Tribute Store. "Email Address" would like to share the life celebration of Patricia "Pat" A. Shewczyk. Click on the "link" to go to share a favorite memory or leave a condolence message for the family.